What do you do when your property is damaged by severe weather? There’s a process to filing a successful insurance claim that will fully cover all of your expenses for repairing the roof and exterior of your home. We have a great deal of experience helping homeowners handling these severe weather damage claims. With more than 15 years of experience helping homeowners in the process of repairing their homes after all types of Minnesota storms, you can relax with us. Damage to roof shingles from 50 mph winds! After the storm event has ended and it appears to be safe to go outside, you need to assess whatever damage – if any – has been caused by the storm. One type of weather event that causes damage is a high, straight-line wind. When this occurs, you may observe some trees are blown down. Possibly fences have been blown over, siding has been blown from your structure, or shingles were blown off the roof by the wind. All of these are caused by wind damage. Hail damage has some rather visible signs. When hail storms are part of a storm, you may notice damage to your siding and gutters. 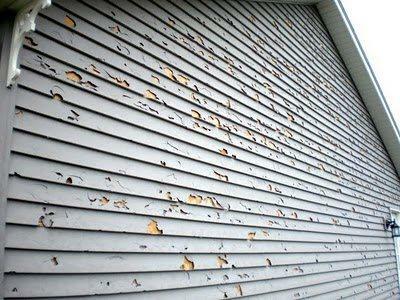 Look for holes in vinyl siding or dents in your aluminum siding. 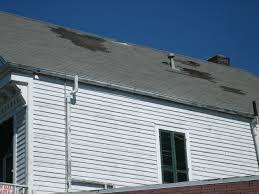 Be sure to observe the gutters for holes (if plastic) or dents (if aluminum). Hail Damage to vinyl siding! Take a close look at your deck to see if any finish was removed from the hail impact. You should also walk around to examine all your windows, checking for broken glass or other parts that may have been damaged. Other tell-tale signs can be found with dents on the garage door or along your metal fascia. If you notice any of these parts of your home’s exterior damaged, there is also a strong chance your roof shingles have experienced hail damage. It’s very common when hail damages other parts of the house that the integrity of the shingles have suffered as well. We can help with the insurance claim for a storm damaged roof. We would suggest getting in touch with your insurance agent as soon as possible after a storm rolls through the area. It’s important to act fast, as it’s likely they will also be busy processing other claims; you will want to get started on repairing your home as soon as possible. Your next call should be to Johnson Exteriors at (763) 355-4458 to schedule a free home inspection. We will quickly come to your property and assess the situation. Here’s something that will make your storm damage claim process a bit easier: We are regarded as a preferred contractor for several local insurance agents. Our experts will make note of everything that we find that is damaged below your roof line on all four sides of your house. We will then climb up on the roof to look there for any additional damage. We will show you pictures of the damage from the sides of your house and a video of any damages we found on the roof, then will explain it all to you in layman’s terms. Once everything is discussed, we have the knowledge to assist you with calling in the claim; this includes getting a claim number to get the process going in the right direction for you. Because we are well-versed at this process, you can feel comfortable as we help schedule a time with the assigned claims adjuster to meet us at your property. At that point, we will point out our findings to the insurance adjuster to make sure they acknowledge everything we discovered. Most adjusters actually prefer to do this step, as two sets of eyes are better than one. You can count on us to help facilitate the process. 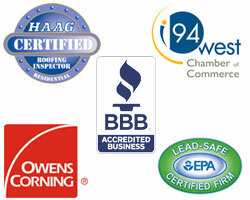 We are registered with the Better Business Bureau (BBB), where we are in great standing with an “A+” rating. Johnson Exteriors is properly licensed with the state of Minnesota and has proper workmen’s compensation and general liability insurance. We will work diligently with your insurance company to make sure all of the damaged items are accounted for and properly reimbursed. This step is important for you, because we don’t want your property to lose any of its value. We do everything we can to keep the process moving. We accomplish this by remaining in constant communication with the claims department until we reach an agreement on all of the items. Once we have the final price approval with your insurance company, we will schedule a time to meet with you and go over the final numbers. We will talk about what work is being completed, and about getting all the products and colors documented. Once all of your colors have been chosen and products documented, we will then schedule your project to be built. You will have the work on your house done as soon as possible and as the weather allows. We will send an invoice to your insurance carrier for the final payment. Additionally, we have your local municipality sign off on the permits. We collect the final payment from you to wrap up the process. We are proud that we’re batting as close to 100% as it gets when it comes to helping Minnesota home owners get full costs covered for the expenses of repairing or replacing their roof, siding, gutters, windows, and all parts of their home’s exterior. Call Bryan and Tracy Johnson today, who will not only repair your property, but also walk with you through the entire insurance claim process.